That’s right folks, we’re finally back in beautiful Colorado! Our first show is tonight in Denver at Cervantes Masterpiece – The Other Side. Sharing the stage with We’s Us. Show kicks off around 9pm. See y’all there! As a treat..some photos from our goings on in August so far..
Keep your eyes and ears open and spread the word!! 0 Free Unreleased DBRS Songs! Get Your Tickets! Free unreleased DBRS songs? Whaaaaa? Yes, that’s right folks. We’ve got a really big show coming up this Saturday, August 18th at Tipitina’s in New Orleans. Buy a pre-sale ticket to the show and we’ll email you 3 unreleased songs from our new upcoming LP The Most Peculiar Thing for free!!! All you have to do is private message DBRS’s facebook page with your ticketweb confirmation # & your email, and we’ll send you some new tunage no one else but the band has heard before! Do it now! Offer will close once we’ve sent out too many mp3’s! 3) Receive your free music! 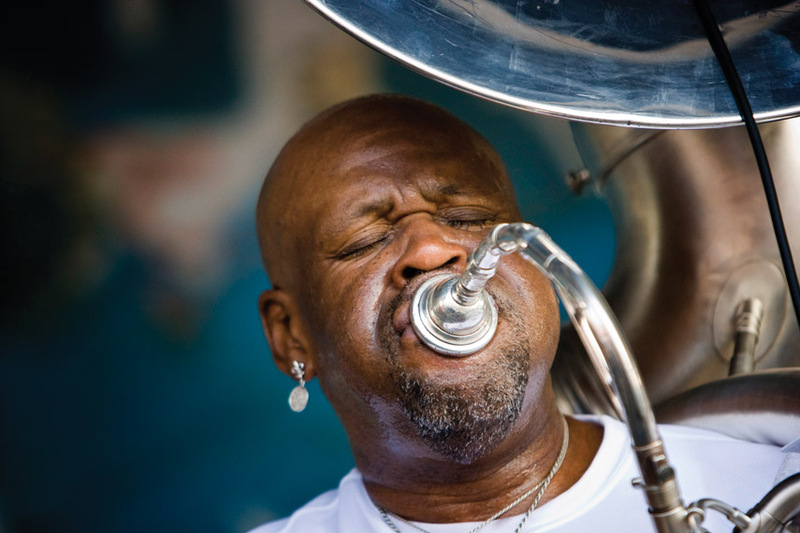 Bywater cats, catch either Johnny Sketch & the Dirty Notes (Loyola Alum’s, Rock mixed w. Strings, Horns, bawdy singing, a damn good time) at the Blue Nile, or the Other Planets (Psychedelic Strange Rock, peep their video here) + Felix at the Always Lounge. Both of these shows start at 10pm. If your hoping for bedroom boogie by 10 & looking for a little earlier entertainment with your pretty little lady, go see Kermit (yeah, I’m pretty sure I don’t need to describe Kermit) at Rock’n’Bowl at 8:30. Even if you can’t catch the show or don’t live in New Orleans, figured y’all would find this interesting, as it is in the similar vein of DBRS. Enjoy, & hope you have a delicious Friday! 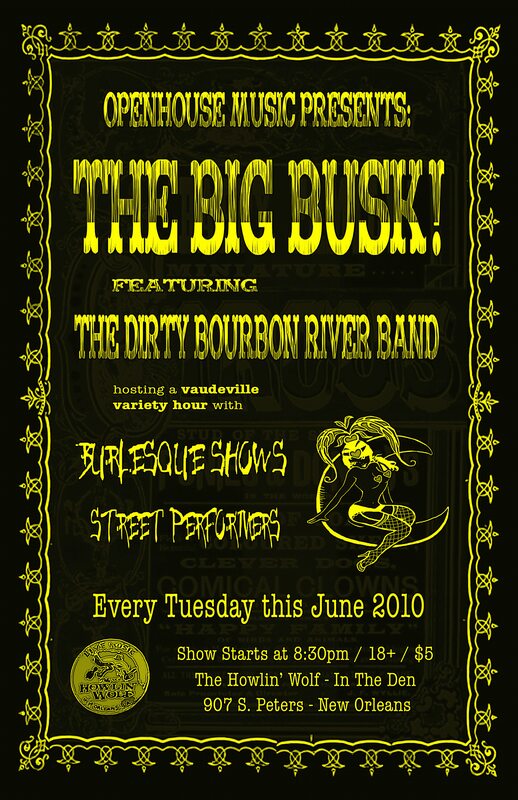 Tonight (June 1st) and every Tuesday this month, the Dirty Bourbon River Show will be featured in TheBigBusk!, a weekly live music burlesque and vaudeville hour at the Howlin' Wolf on 907 S. Peters in the Den. 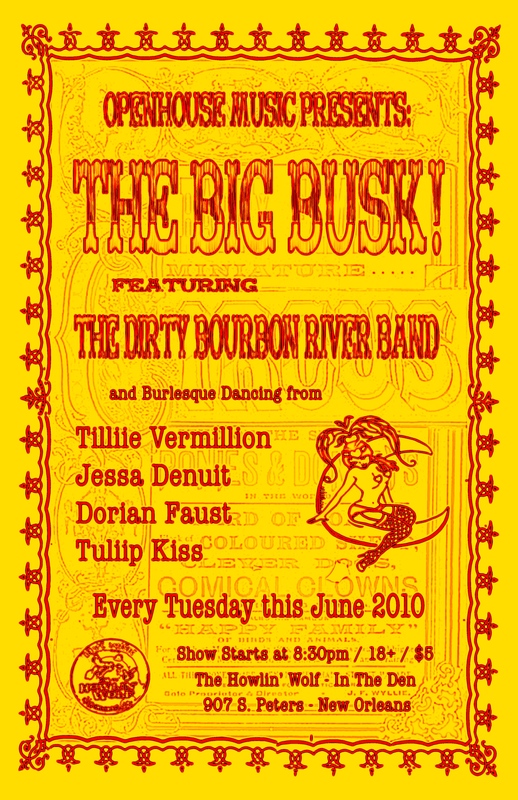 Tonight (June 1st) and every Tuesday this month, the Dirty Bourbon River Show will be featured in TheBigBusk!, a weekly live music burlesque and vaudeville hour at the Howlin’ Wolf on 907 S. Peters in the Den. Tix only 5 bucks, doors open at 8, sets at 8:30 & 9:30pm. Pack your whiskey nip and your sinnin’ boots – it’s going to be a classic, damn good time. Hope to see you there.